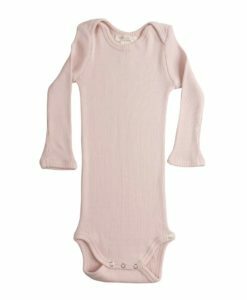 A ribbed dusk pink bodysuit with all over cloud print. Snap buttons at crotch and shoulder for easy dressing and changing. against light surfaces. We recommend to gently handwash these items upside down with cold water and neutral liquid detergent. Please do not rub when using stain-remover.